Books in the Westminster Bible Companion series assist leaders and students in their study of the Bible as a guide to Christian faith and practice. Each volume presents the text under discussion, explains the biblical book in its original historical context, and explores the text's significance for faithful living today. These books are ideal resources for preparing text- based sermons and a worthy addition to seminary courses and advanced Bible study groups. 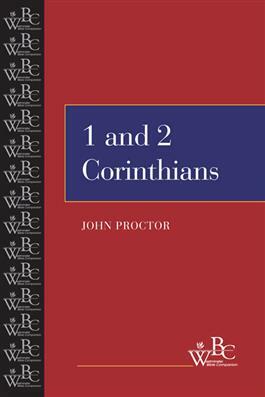 In this volume, John Proctor provides an accessible study on First and Second Corinthians. Paul's first letter to the Corinthians addresses the basic components of human life, such as leadership, marriage, hospitality, and bereavement. The second letter mostly revolves around the pains and joys of a pastoral relationship. Proctor's volume provides insightful commentary that examines how the letters spoke to the people of Corinth and how they are received today. "John Proctor's journey through the Corinthian correspondence will help readers pay attention to the apostle, to his first listeners in Corinth, to the questions they raised with him, and to the culture that shaped their relationships. A wise and experienced interpreter, Proctor keeps contemporary as well as ancient religious experience in view and builds thoughtful bridges between them."